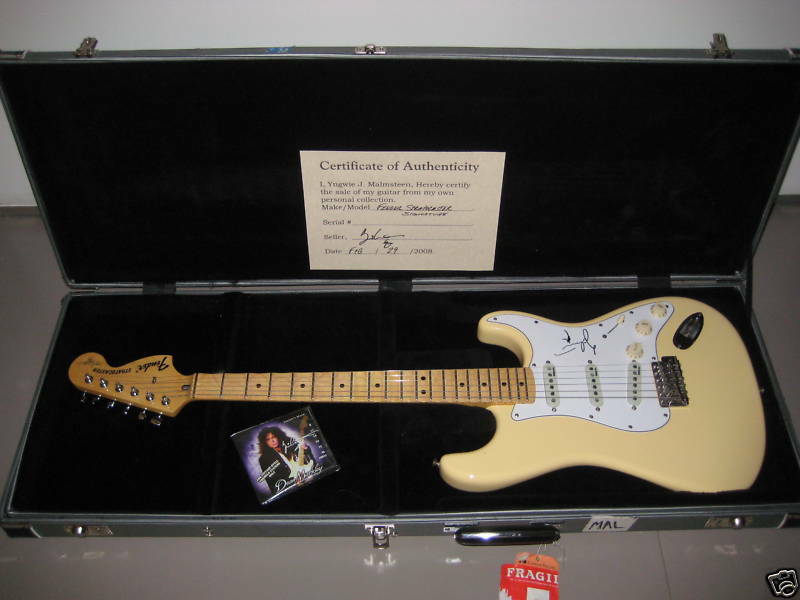 According to the seller this is one of Yngwie's personal signature model Stratocasters. You might remember a previous eBay listing by this seller for Yngwie's #3 Strat. 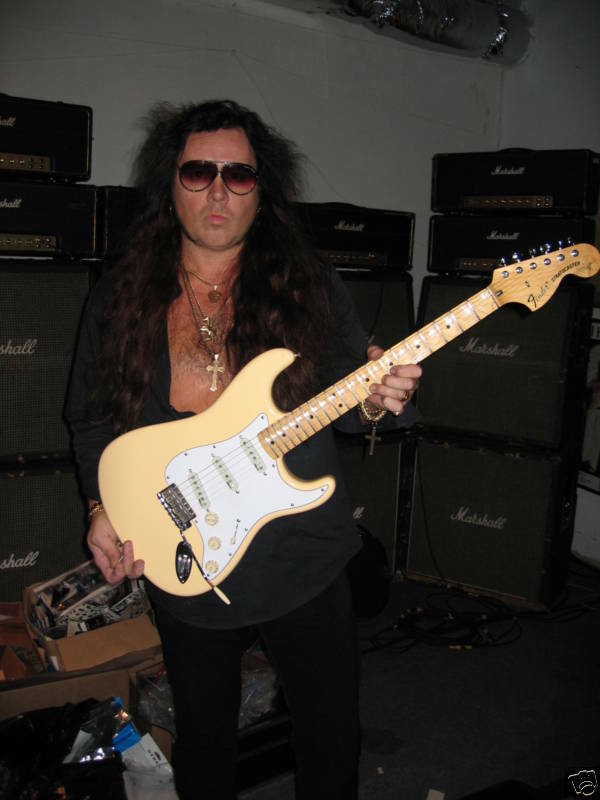 Looks like Yngwie is using guitars from his personal collection as currency to finance his ever growing stable of Ferraris. Smart man. This guitar comes with a Certificate of Authenticity signed by Yngwie J. 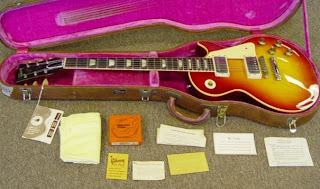 This 1960 cherry sunburst Gibson Les Paul comes with all hang-tags and paperwork intact and in dead-mint condition. 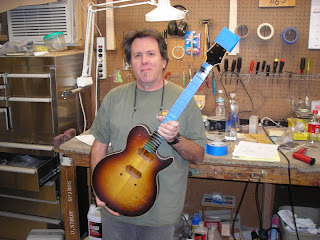 The guitar appears to be in pretty good shape too! 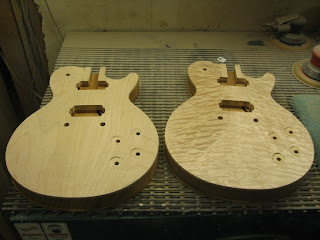 The nitrocellulose finish appears unmarked and pristine -- except for a little finish wear on the top edge of the back of the headstock, there appear to be no finish checks, belt-buckle rash or other wear spots from looking at the pics. And the red pigment in the sunburst paint-job hasn't faded at all. This guitar has probably not seen much light of day in its 49 years -- a closet classic in the truest sense of the phrase. 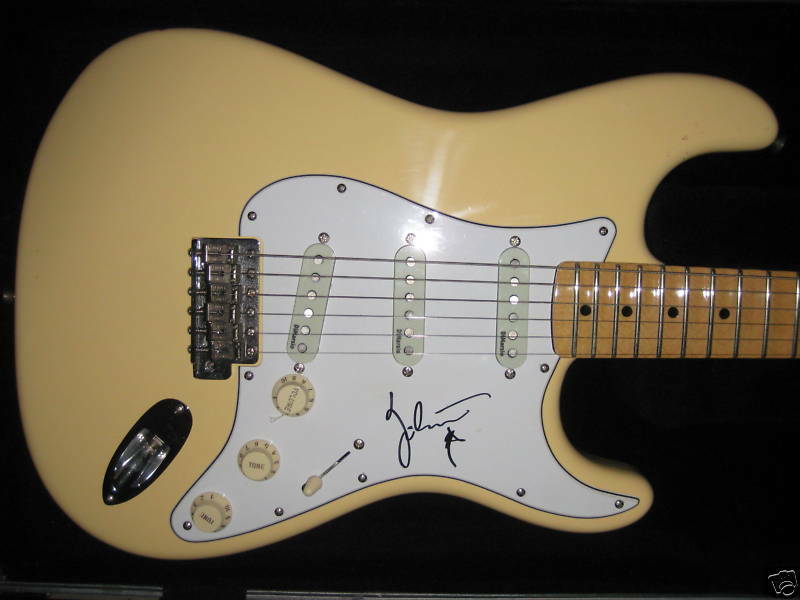 This guitar doesn't come cheap. And that's an understatement considering the Buy It Now price of $325,000. But this could be one of the most sound investments one could make, if this Guitar Trader ad from 1979 is anything to go by. I'm back and it's good to be home! I didn't find much by way of guitar stuff. Bali is pretty much about sightseeing, food, beaches, surfing, partying and more food. And the scenery was breathtaking! 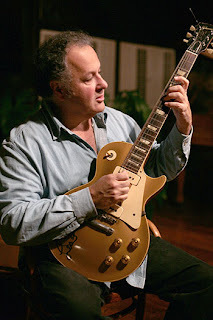 Sometimes it's good to get away from the guitar for a bit, commune with Nature and connect with the Universe. I'm off for a vacation to Bali from Sunday 15th November 'til Thursday 19th November. The hotel where I'm staying at is supposed to have internet access but in case they don't, hang in there, dear readers! You're important to me. 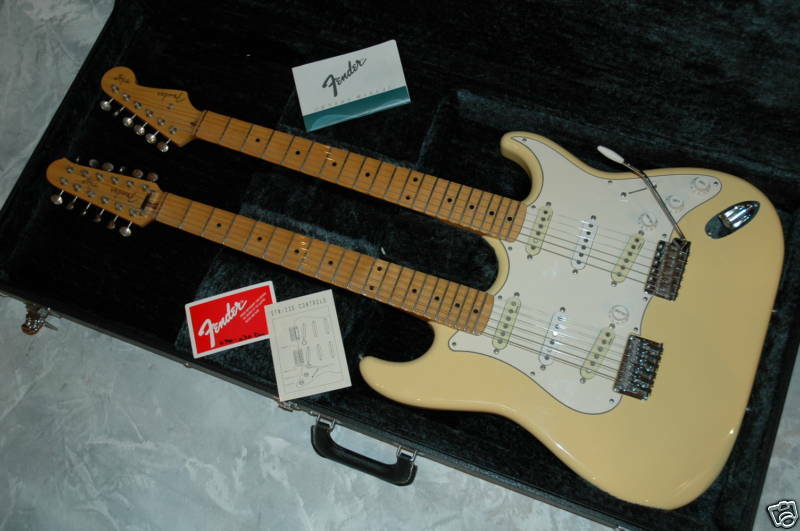 L.A. Vintage Gear has been auctioning a lot of stuff for Landau recently and according to them these are from his "extensive pickup stash". 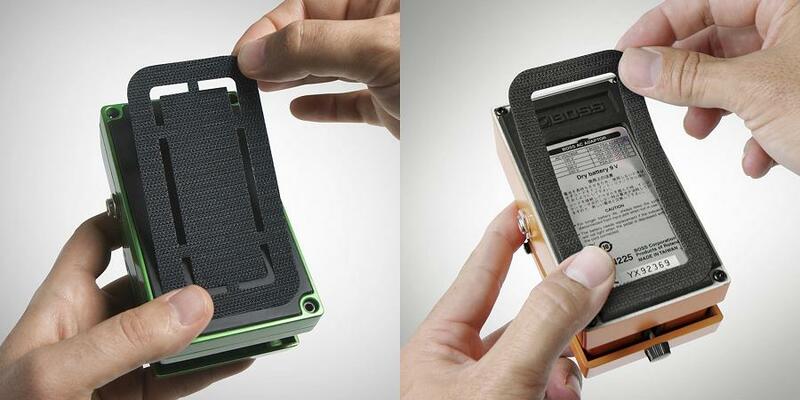 The original covers and black Patent Applied For stickers are still intact. 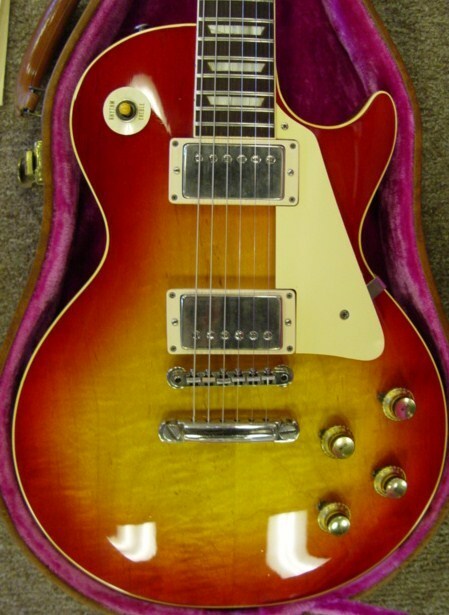 Gibson applied for a patent on their humbucking pickups on 22nd June 1955 and were awarded the patent only on 28th July 1959. 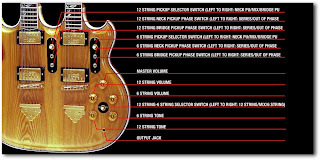 But interestingly, from 1957 to 1962 Gibson stickered every pickup with a Patent Applied For label. It was only after '62 that the patent number started appearing. 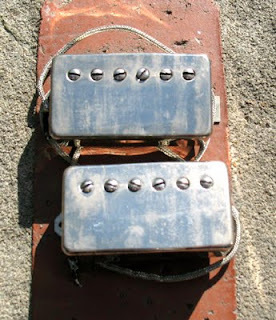 One of the pickups in this matched set was rewound by John Suhr -- probably due to a broken coil -- while the other remains stock. 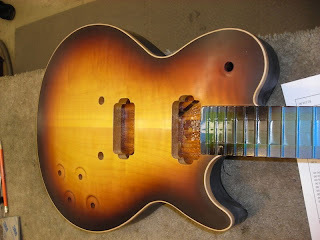 L.A. Vintage Gear has taken this mod into consideration and shaved a fair bit off their Buy It Now price. Here are a couple of clips of session maestro Mike Landau in the studio. That tone, that vibrato, those Tylers! In the first clip he plays a beautiful wah-inflected solo. I love the way he just nails those changes starting at 0:16! In the second clip we see Landau using some of his 'mystery' voicings -- he seems to favor rootless chords, sus4's, add9's and the occasional superimposed triad -- processed through a rackmounted Dyno-My-Piano Tri-Stereo Chorus. 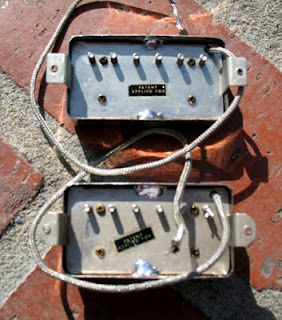 Or a cheap Arion SCH-1 Chorus pedal, depending on the era in question. Based on Mike's hair my bet is on the Tri-Stereo here. Check out the spicy volume swells. In the third clip Mike places an Ibanez TS808 Tubescreamer at the front of his signal chain for a touch of extra gain, but decides to turn it off before he starts tracking. His sound through the Bogner amp (?) is positively huge, with a tad of harmonizer to fatten up the sound. He fluffs the descending line at 2:47 -- twice -- but what the hey, they'll fix it in ProTools. James Taylor's live-in-the-studio Squibnocket DVD features Mike's playing extensively. Check Out Mike Landau CDs Here! 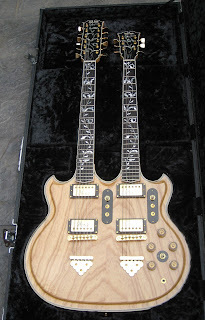 A slightly less ornate version of the Rex Bogue Double Rainbow that was built for John McLaughlin, the Ibanez 2670 Artwood Twin came out around 1975 and was available only on special order. 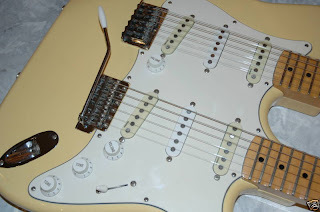 This was a top-notch, no-expense-spared instrument. 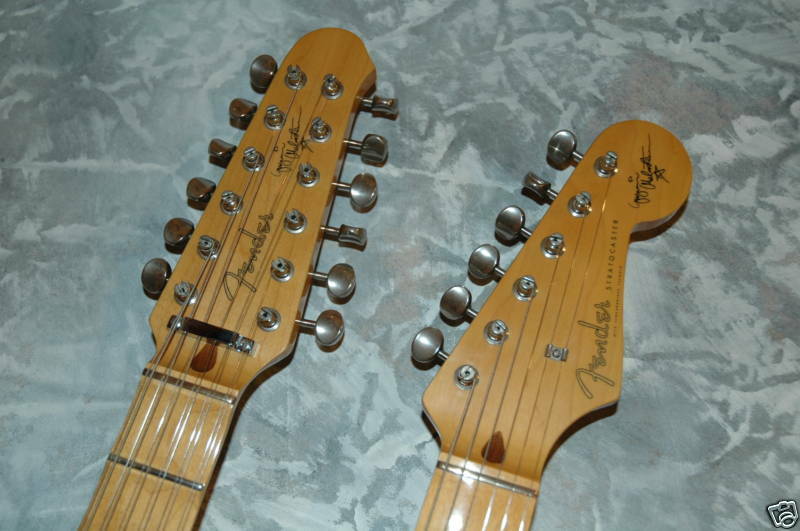 Reissued in 2006, the Artwood Twin was faithfully recreated from the original blueprints by the same luthiers who built the early models. 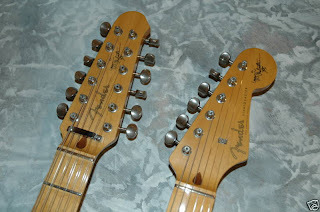 The only specification changed was that Ibanez replaced the original Super 70 pickups with Super 58's on the reissue. 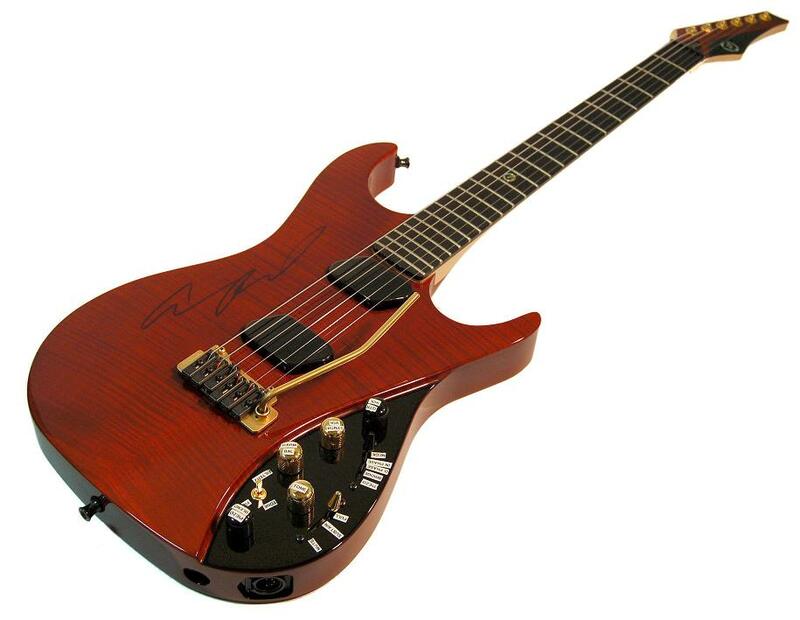 Interestingly, the Tree of Life mother-of-pearl inlay on the 2670, adapted and simplified from Rex Bogue's original intricate design on the Double Rainbow, is still used by Ibanez today on their Steve Vai signature and higher-end Prestige models. A layout of the controls and the various switching possibilities on the 2670 is shown in the diagram below. Again the 2670's controls nearly duplicate Bogue's original design sans built-in preamp.